Cyclone Hudhud: India is about to face a monster of a storm. It’s now not if, but exactly where and at what strength Cyclone Hudhud will strike the Indian mainland. One of the two state governments likely to be most affected has gone all-out, setting a “zero casualty” target and prepositioning relief supplies. A U.N. disaster management gateway has issued a red alert for “high humanitarian impact” and estimates 9.5 million people will be affected by the storm. Hudhud, named by Oman after a type of local bird, is expected to make landfall late Saturday or early Sunday, India time. According to the Times of India, widespread price gouging in coastal areas has already been reported for items like vegetables, candles, matches, and batteries. Hudhud already has a large circulation, with swirling clouds covering nearly the entire Bay of Bengal. The most accurate global weather models (like the GFS and the Euro) agree that Hudhud is likely to continue growing, with warm water and a stable upper atmosphere conducive to rapid intensification. A U.S. National Weather Service high-resolution model tailored specifically to tropical cyclones is calling for Hudhud to peak at Category 4 strength and drop more than a meter of rain as it moves inland. One meteorologist thinks it could grow even stronger than that. Hudhud will arrive a year to the day after 2013’s Cyclone Phailin, one of the strongest storms in India’s history. Thanks to a recent surge in mobile phone usage and swift evacuations, casualties were limited during Phailin, and the country was able to avoid a repeat of the horrendous 1999 Odisha cyclone that killed an estimated 10,000—despite dealing with a storm of similar strength. In a worst-case scenario, atmospheric conditions are suitable for Hudhud to match or exceed Phailin’s size and strength. Forecasts are beginning to hone in on a landfall location for Hudhud along the northern coast of Andhra Pradesh, south of where Phailin made landfall last year. That may help limit the most dangerous threat posed by Hudhud, as with any landfalling tropical cyclone in this region: its storm surge. 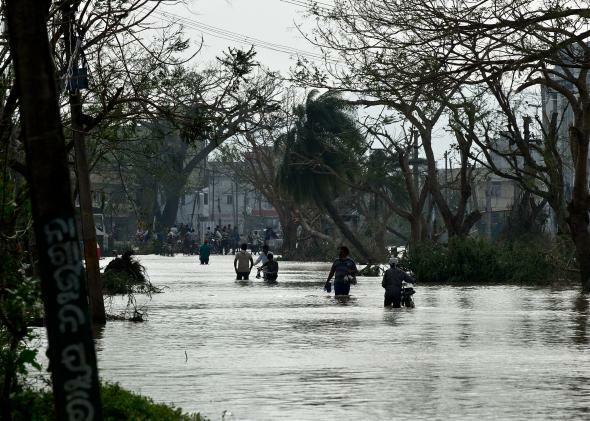 The Bay of Bengal has experienced some of the deadliest natural disasters in world history. Cyclones like Hudhud push massive amounts of seawater toward land, raising the local level of the ocean and inundating coastal areas and densely populated river deltas. As with Phailin last year, local geography may help to limit the distance Hudhud’s surge pushes inland, should the storm stay on its current track. Hudhud will strike India’s coast as a powerful—and strengthening—tropical cyclone. India’s Meteorological Department is notorious for underestimating the strength of tropical cyclones in official advisories and was sharply criticized (by me and others) for doing so last year as Phailin was approaching shore. At Phailin’s peak, the IMD estimated the storm’s sustained winds at a whopping 30 mph less than most international agencies. Phailin’s central core weakened substantially just before landfall, which also reduced the danger it posed and helped IMD justify its forecasts. The department is doing it again with Hudhud. The latest forecast from IMD showed Hudhud topping out with only 85 mph sustained winds, 35 mph less than the U.S. Military’s Joint Typhoon Warning Center’s forecast. Since Phailin, the IMD has instituted a series of major upgrades, including a new weather satellite.